Book a private jet charter flight to Ithaca, a college town located on the southern shore of Cayuga Lake in the Finger Lakes region of Central New York. Private jet charter flights can arrive at Ithaca Tompkins Regional Airport (ITH), centrally located in the city and offering upscale travel services through its private FBO. Enjoy instant access to thousands of private planes in your area, competitive rates on all of your charter flights, and the flexibility to travel when you want, where you want. Our services extend around the world for private jet charters, executive charter flights and corporate business jet rentals, and we’re available 24 hours a day to meet all your private aviation needs. With instant access to thousands of private planes and helicopters located around the world, we can arrange the perfect aircraft at the right cost for your Ithaca private charter flight, whether you’re traveling internationally or domestically. Air Charter Advisors is Wyvern-certified, and all of the private aircraft we arrange are operated by FAR Part 135 (or foreign equivalent) air carriers. We also offer access to a wide variety of Wyvern Wingman/ARGUS Platinum aircraft when required. We can also assist with jet card memberships, private plane sales & acquisitions, and we offer private jet marketing and management services utilizing one of the largest marketplaces for on-demand private aviation. Enjoy the convenience and peace of mind you get from working with a trusted jet charter broker, and let us become your comprehensive solution for luxury air charter, aircraft acquisition and private jet management. Call us at 1-888-987-5387 or request a quote for your charter flight to Ithaca, NY. We’re here to assist you with all of your private aviation needs, from booking your private jet and creating its flight itinerary to arranging gourmet in-flight catering, luxury ground transportation, helicopter lifts and any other requests you may have – consider our Ithaca Jet Charter Service your one-stop shop for all things private aviation in Central New York. Private flyers can arrive directly in Ithaca by arranging their private jet charter flight to Ithaca Tompkins Regional (ITH), the main airport serving the Finger Lakes region. Short flights on piston/prop planes can be arranged using Cortland County Airport, also known as Chase Field, located 20 miles northeast in the city of Cortland. You can also choose to arrive 35 miles southwest of Ithaca using Elmira/Corning Regional Airport (ELM). Named after a Greek Island with a decidedly more tropical atmosphere, Ithaca is a small town of many contrasts in itself, and private charter flights to the area attract vacationers, business travelers, college students, and more, despite the lack in Mediterranean climate. 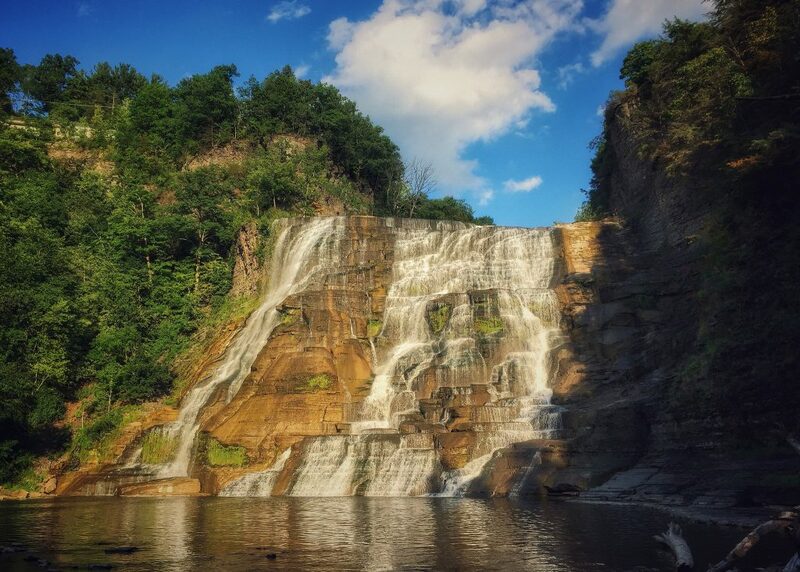 While Ithaca is very much a college town, it’s home to several eclectic shops and restaurants, it’s deeply rooted in politics, and it’s surrounded by beautiful outdoor amenities, including several gorges, waterfalls, and greenspaces, making it an enjoyable visit via private jet for all sorts of travelers. As a college town, Ithaca experiences an ebb and flow of mass matriculation during various times of the year, but it’s home to a vibrant community that offers more permanence than most college towns. Ithaca is famous as the home to Cornell University, an Ivy League school hosting more than 20,000 students. Cornell excels in state-wide agricultural and veterinary research, and is the New York’s land-grant university. 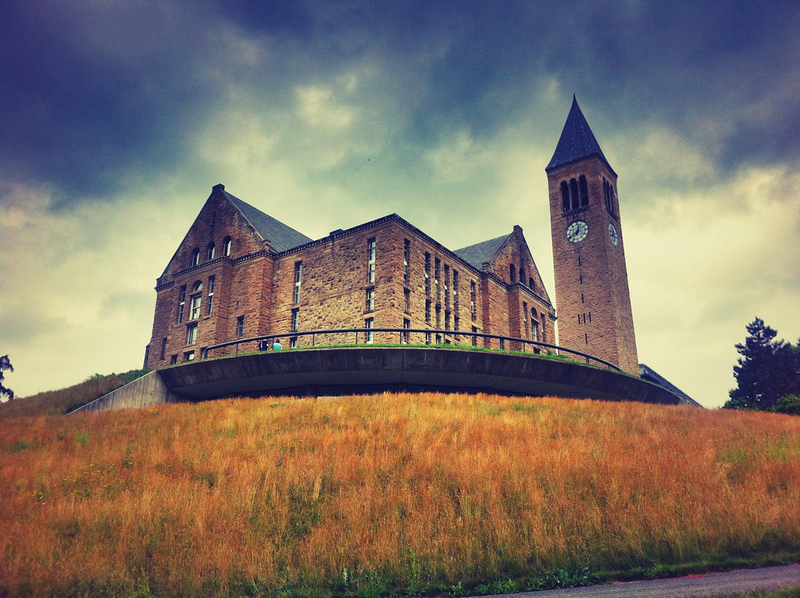 Ithaca College is another major institution of higher learning located just south of the city in the Town of Ithaca, adding even more to the educational atmosphere. Ithaca features a humid continental climate, and is much cooler than New York City. Winters are cold, and can get bitter at times, with temperatures dropping below zero degree Fahrenheit 10 times a year and heavier snow than near the coast. Obviously, summer is the best time of year to arrange your charter flight for vacations and leisure activities, offering dry, sunny days with crisp, cool nighttime temps. Fall is another great time for a charter flight, with foilage peaking in early October and rivaling any fall foilage display you’ll find in New England. Ithaca offers some of the best and most diverse cuisine in upstate New York. The highest areas of concentration for restaurants are in Downtown and Collegetown. It’s also where you’ll find the most variety, whether you’re looking for pizza, Chinese, Japanese, Korean, Indian, or fine-dining options. If you’re not sure where else to look, take a stroll downtown along “Restaurant Row” on North Aurora Street, offering plenty of options to satisfy your cravings. The Statler Hotel at Cornell University is the only four-star accommodation located in Ithaca (Collegetown), while the Aurora Inn is available just up the east side of Cayuga Lake in Aurora, NY. Head over to the north end of Seneca Lake to enjoy a stay at either Geneva on the Lake or Belhurst Castle. Watkins Glen International is located about 30 miles to the west, and is the site of several motorsports events, including NASCAR’s only visit to the state of New York for its annual road-course race at Watkins Glen. The track is often referred to as “the Mecca of North American Road Racing”, and is a popular circuit among both fans and drivers. ACA private jet charter service offers access to private planes based in Central New York, and all across the United States. Our broad access to a network of more than 5,000 private jets allows us to connect you to the perfect plane for your Ithaca private flight, including empty leg jets, one-way routing, and round trip charter flights. We review third-party audits to make sure aircraft and flight crew comply with our safety standards, and we offer competitive rates and zero-commitment quotes on all your flights whether you’re flying domestically or into the US. Our negotiated rates and relationships with aircraft providers allow us to pass the savings on to you, often beating jet card pricing by 10 percent or more. Review all of the aircraft options for your Ithaca jet charter with one of or brokers. Private flights to central NY state can arrive using the following airport located between 25 – 35 nautical miles from Ithaca. There’s a popular private jet hub available at Greater Binghampton (GBR), while leisure flights are often arranged to Seneca Falls using Finger Lakes Airport. Ask your broker about all of the airport options for your flight, and the benefits each offers. Request a free charter quote or give us a call at 1-888-987-5387 and speak with our private jet charter brokers about arranging your private flight, executive charter or corporate jet rental to Ithaca Tompkins Regional Airport in Ithaca, NY. Our team offers the highest levels of service, flexibility, and safety, together with the most competitive pricing in this level of the on-demand private jet charter market.